A used car dealership in Stourbridge has been left gutted after a fire ravaged the building. Hays Car Centre suffered internal damage, while two people had to be treated by paramedics at the scene. Eleven cars at the facility were also wrecked in the blaze, which occurred on 9 October. Fortunately, those working at the time of the fire survived the incident, however the building and its contents were not so lucky. While the owners will likely be left devastated by the blaze, having sufficient motor trade insurance will ease the pain slightly. A suitable combined motor trade insurance policy in this case would include building insurance, employers’ liability and business interruption cover – to enable the company to claim back any loss of earnings caused by the fire. Five fire engines attended the fire, which began after 5pm, the Express & Star reported. 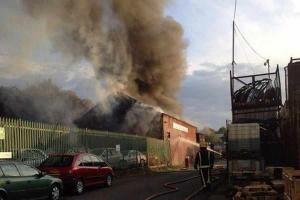 Dudley station commander Steve Lees said: “Due to the severity of the fire we quickly surrounded the building. It was already well developed by the time we arrived. Initial investigations suggest the fire was started by accident, as witnesses commented that it might have been set off when an electric drill set alight a fuel tank.